The perfect game is baseball's ultimate pitching achievement. Using original interviews, contemporary accounts, and in-depth research into historical records, James Buckley Jr. has created an amazing record of history's greatest pitching performances. 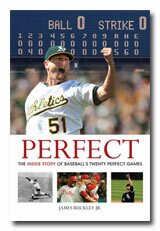 From J. Lee Richmond in 1880 to Roy Halladay in 2010, Perfect features a wealth of little-known stories and facts that are sure to surprise and delight baseball fans of all ages. Paperback, 307 pages.